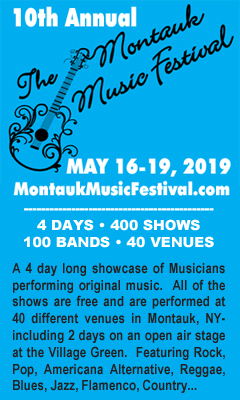 Another step was taken in the campaign to keep our local waters clean on March 6th, as Montauk residents now have a safe place for the disposal of their unwanted or expired prescriptions and over-the-counter medications. 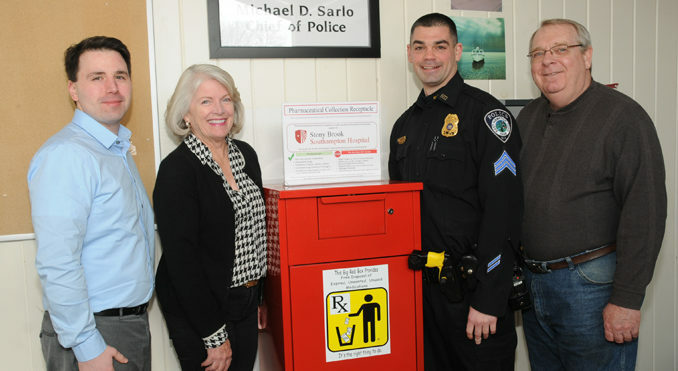 Thanks to the combined efforts of the Montauk Citizens Action Committee, the Concerned Citizens of Montauk, and the East Hampton Town Police Department, a “Big Red Med Disposal Box” was installed at the East Hampton Town Police Precinct at 8 South Embassy Street. 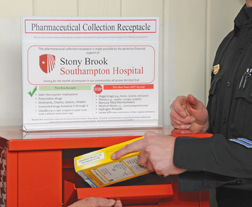 Dr. Michael Genereux of the Meeting House Lane Medical Practice, East Hampton Town Councilperson Sylvia Overby, East Hampton Town Police Sergeant Kenneth Alversa and Tom McAbee, President of Big Red Med Disposal Box showed off the Box, which is sponsored by Stony Brook Southampton Hospital.